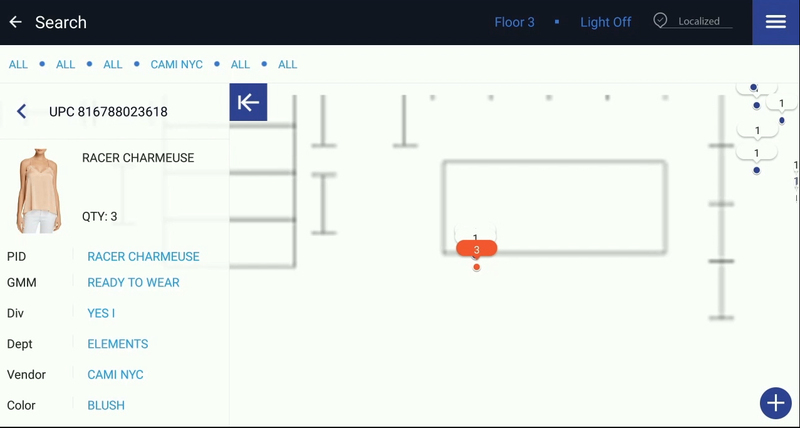 StealthMatrix works with patent pending algorithms and industry-specific hardware to help clients create 2D on-demand floor maps, locate merchandise with Internet of Things (IoT) sensors, generate augmented reality workflow processes and conceptual environments, without expensive build-out. StealthMatrix ARCTM is an IoT sensor-based hardware and software prosumer device, modularized and flexible to fit each client’s dynamic environment. It supports both internal operations and customer-facing mobile applications. All team members, from Senior Executives to sales associate, have a single pane view of inventory over the entire operation. Leveraging augmented reality and AI technologies, StealthMatrix ARC is a commercially available, prosumer mobile-based device built for Retail Item Level RFID. StealthMatrix is a sensory-based item-level tracking system that locates merchandise within 3 feet, using IoT sensor technology. 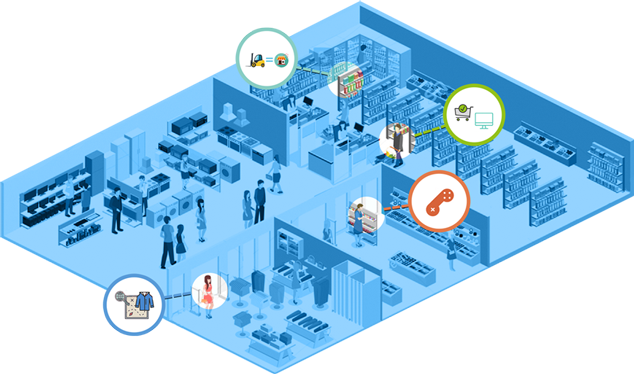 It will transform an entire operation into a true omni-channel organization, increasing the shopping experience. 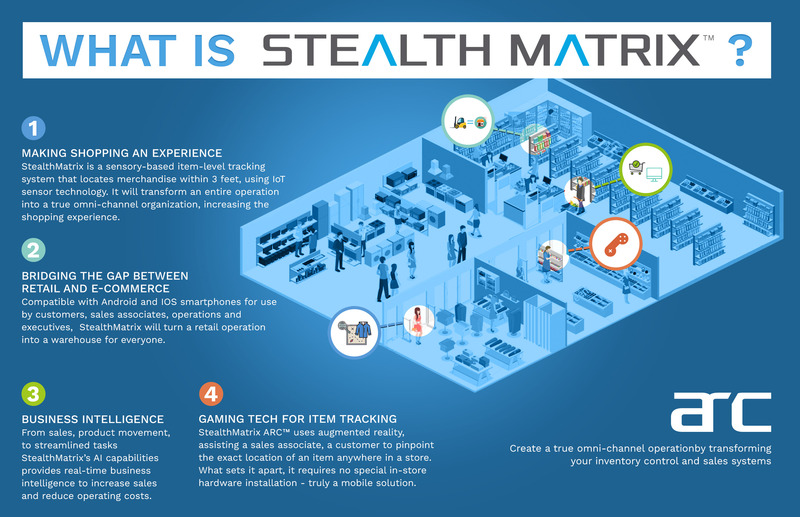 Compatible with Android and Apple iOS smartphones for use by customers, sales associates, operations and executives, StealthMatrix will turn a retail operation into a warehouse for everyone. From sales, product movement, to streamlined tasks StealthMatrix’s AI capabilities provides real-time business intelligence to increase sales and reduce operating costs. 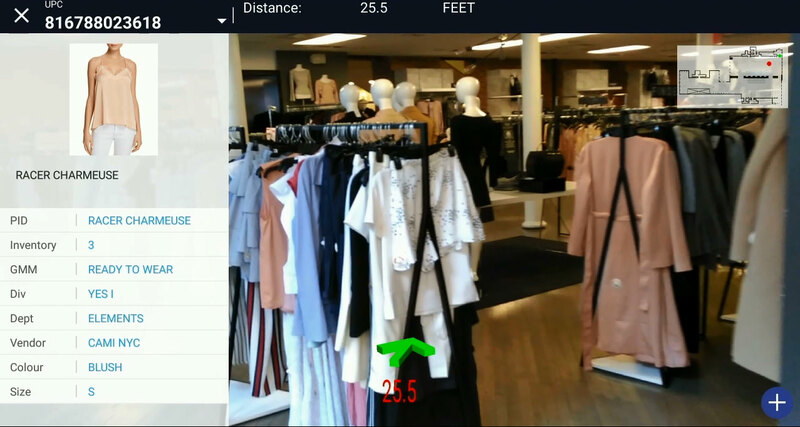 StealthMatrix ARC™ uses augmented reality, assisting a sales associate, a customer to pinpoint the exact location of an item anywhere in a store. What sets it apart, it requires no special in-store hardware installation – truly a mobile solution. 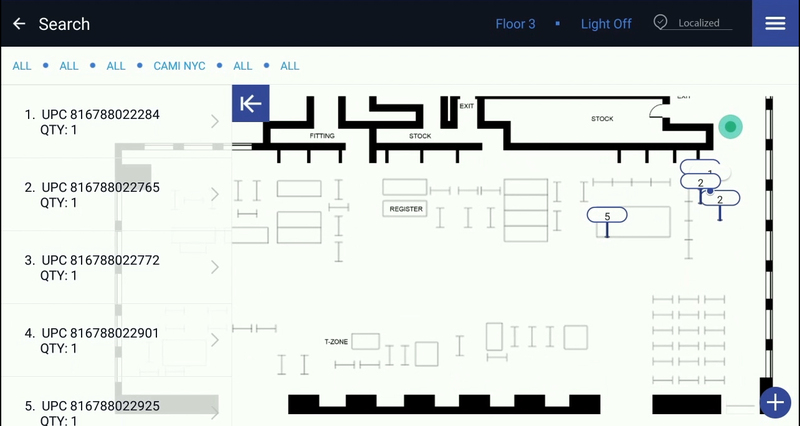 The device creates a virtual map with fixtures, display cases, walls, entrances and exits to scale. The map traces the user’s steps and displays the user’s pathway and boundaries. The ARC creates a virtual 3D map, transforming it to an easy to navigate 2D format. 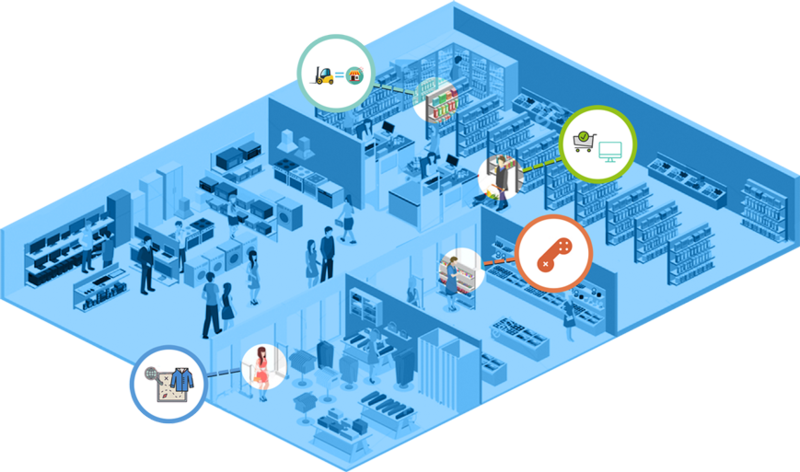 Device scans the sales floor and stockroom, collects RFID signals and maps location. 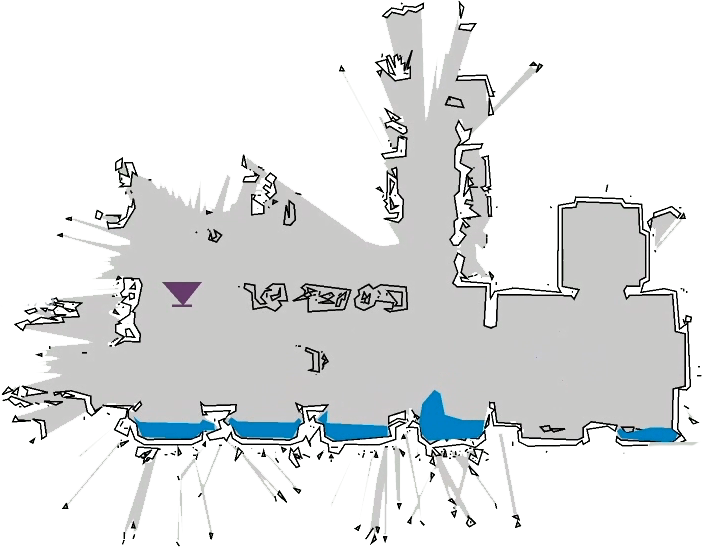 A 2D map is used to navigate the user to the desired item anywhere in the store. The user can enter specific filters for their search (vendor, department, UPC #). The device creates a rapid beeping sound to notify the user when he or she is within three feet of the item. What Makes StealthMatrix™ Stand Apart? “Our team is the best in the field of RFID technology. They have designed a product to increase retailers’ top and bottom line sales with gaming technology that visualizes and leverages current inventory to maximum advantage. Consumers now have the confidence of knowing a store actually has the inventory indicated on their e-commerce site. All they will need to do is order on-line and pickup in store, or have merchandise delivered.